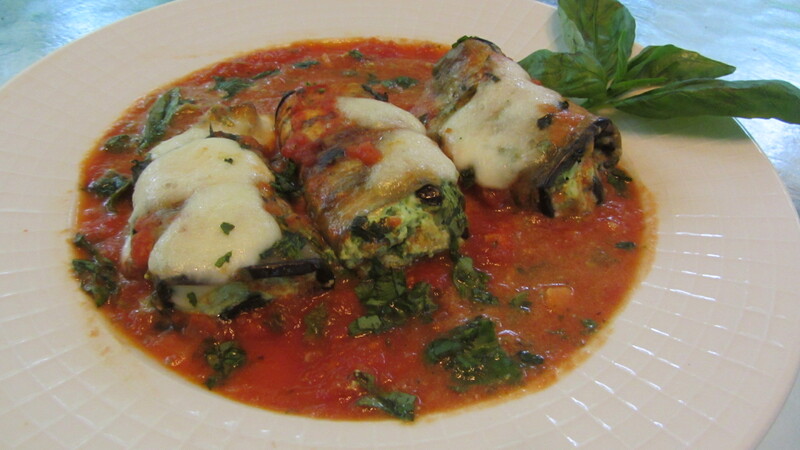 Here is a lightened up version of Eggplant Rollatine. You can just simply make it eggplant parmigiano if you don’t want to stuff it. I mostly peeled the eggplants, then sliced about 1/4 inch thick into planks. I salted them and put some heavy cutting boards on top of them and left them alone for about 1/2 hour to get out the bitterness. (an old italian method). It really works because after the 1/2 hour you could see all the dark colored water that came out of it. Then you rinse them off and dry with a dish cloth. Then place on a baking sheet. I sprinkled them with dried oregano and drizzled with extra virgin oo and a little salt and pepper on both sides. Preheat oven to 400 and let cook about 10 minutes on each side till brown but not too crisp. Must watch , every oven is different then turn and do the other side. Take out and cool. Into a bowl I added ricotta chesse (can use part skim), one organic egg, and i pureed organic baby spinach along with fresh basil and parsley in a food processor. The cheese you don’t do in the processor, just mix in a bowl with the egg, then add the pureed greens and a little parmegiano reggiano and pecorino romano. Black pepper too. Take out a baking dish. Spread out the eggplant planks and starting on the narrow side add about a teapoon or more of the green cheese mixture, then roll of carefully and place in a baking dish. 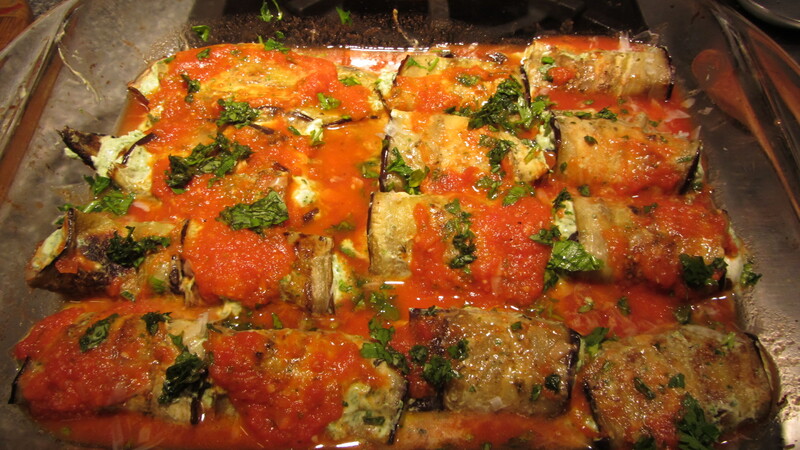 First add a layer of your favorite tomato sauce to the bottom of the pan and put eggplant rollatines on top. Add to this some fresh mozzarella or part skim shredded. Thank you. I hope you try it and let me know how it comes out! Have a great long weekend ! Thank you, I loved it, but Doug said he likes it more, fried. What does he know???? Made this last week & didn’t miss the frying but did have to go easy on the greens because of high vit. k ….It was Great!! Even Eli liked it..